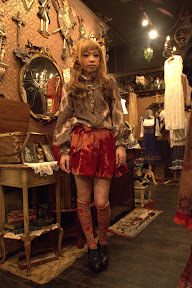 The Wonder Land fashion blog in collaboration with Parco City, present a series of coordinate snaps of Hitomi and Kaori. All set against the beautiful backdrop of Grimoire. There are also the usual Wonder Land interview with each of them as well. The photographs are absolutely stunning! Do you know if Heri has a blog or a place where she post her coordinates, she's my favorite.